Jerusalem - A pre-election gathering in Israel turned controversial when the head of a prestigious yeshiva slammed the Israeli government for not allowing gender segregation on public buses, noting that even the Nazi regime understood the need to separate men and women. 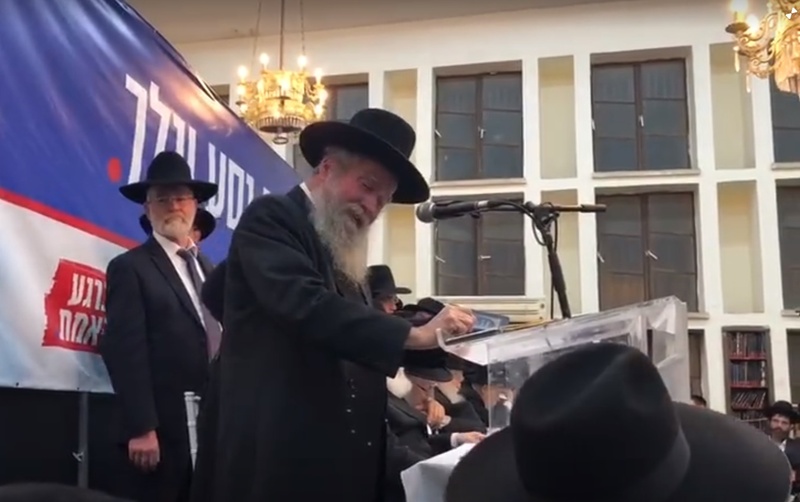 Rabbi Aviezer Piltz, dean of Yeshivas Toshiya in Tifrach, made the remarks on Saturday night at Bnei Brak’s Lederman synagogue in the presence of Rabbi Chaim Kanievsky and Rabbi Gershon Edelstein at a gathering launching the United Torah Judaism election campaign, reported Kikar Hashabat (http://bit.ly/2YjOYJi). Speaking out against secular Zionism, Rabbi Piltz criticized the country’s refusal to allow forced separations between men and women on government-run buses. Several Charedi-run buses have men seated in front, with women located in the bus’s rear section. The Nazi reference was just one small part of Rabbi Piltz’s fiery remarks which criticized the Israeli government for interfering in religious education and noted that, throughout history, those who attempted to secularize Jews have failed. In an interview with an Israeli radio program, Degel Hatorah representative Rabbi Yitzchak Pindrus who organized the gathering said that the Nazi reference was used just as an example and had been blown out of proportion on social media. if he likes the Nazis so much why doesn't he go back ? Last time I checked there is no restriction to leave Israel, if they don't like it let them get hell out of there. Religious Zionism is worse than secular Zionism. There is no such a thing as a "Medina Al Pi Torah". It is a Torah forbidden state. ברוך הוא אלוקינו שבראנו לכבודו והבדילנו מן התועים ונתן לנו תורת אמת. No one's ever heard of him, so he's hitching his wagon to that old Nazi star to try to make a name for himself. מֵשִׁיב חֲכָמִים אָחוֹר, וְדַעְתָּם יְסַכֵּל. Is this what we call "dass torah"
Reading it, just makes me want to throw up. I am not a Zionist by any stretch although I am not Satmar etc. either. But I agree with the others here. Weird thoughts! What is it his business to tell the Bus company how to run their buses. Nobody is forcing him to ride them I would presume. It is a free country. Did he ever try to speak softly with the owners and ask that way? And even if he did and they refused they can do what they want they are free to choose. He’s a Rosh Yeshiva ?!? In the Beis Hamikdash the women sat higher up then the men; so the buses should probably have the women in front and men in the back. “ Is this what we call "dass torah"
I also want to throw up when I hear the words dass torah Because over the years these so-called dass torah people have always spoken out against others put down others allowed And taught their students to behave in the same fashion. He probably took a double dose of Am Horatzis pills that morning. I will be sure to write the name of his eh hem yeshiva down so when the next shnorer comes along beitin berachamim for gelt, I will tell him his friends in Bavaria are waiting, with segregated buses. This 'rav' expressed the true hateful feelings of so many charedi living under the protection of the JEWISH ZIONIST STATE. For him to reference the nazis this way shows how these charedi have lost their minds. OTD anyone? I speak as a child of survivors. I grew up with the shadow of Auschwitz over my childhood. My belief is that all these so called Gedolim come from a generation that avoided the shoah. Maybe they were the lucky ones spirited out overnight after telling my Mother and her family to stay. After a while these E.Y. people think they are invincible. I call it das Gaaveh. With this type of a speech no wonder why MESHIACH is not here.May Hashem have mercy on us and send MESHIACH NOW even though we are not worthy of him. That was the satmar reba zy'a shita. Rav Kook Zt"l disagreed. And let me remind you that the late founder of the right wing peleg party was R shumel Aurbach. ZT"L no leftie Zionist at all. His father R shomo zalamn zt"L learned by rav kook as did R Elyshav zt"L.
Forbidden al pi torah?? yes according the reba ZYA an aggdata gemara on sholosh shevous forbdis us. Other leading poskim not just R kook, held that we do not pasken like an aggdata gemara and its therefore not binding. Ponvitcha rav and R lazar Yudel flew an israeli flag in their yeshiva on yom hatzmut. The stamar reba was holy and I respect his shita but lets put things in context. True, the government is not benevolent to the Yeshiva velt. But Nazis? This borders on stupidity that only an idiot would say, yet it is a Rosh Yeshiva? If people don't want female pics in bnei brak or meah shearim levae them be. That's how the overwhelming majorty want to live. Why disturb the peace? Israel as wa whole needs to get their act together and stop the antagonism. this is what leads to insanity and nazis name calling. So another Charedi Rabbi has, apparently, failed to study Leviticus & speaks lashan hara against other Jews! Another Charedi Rabbi adds to the words of the Torah in direct contravention of HaShem's prohibition against doing so....there is NO law to say men & women must be separated in the way he deems. The Torah was given to ALL the Children of Israel. Men & women together. There was NO separation at the foot of Mount Sinai! Maybe this was why HaShem did not even mention Rabbi's in the Torah. He clearly did not intend for them to exist! Understood, it's a state not according to the Torah. So exactly what do you recommend, allow the arabs to obliterate the State of Israel including the Jews or maybe Israel should dissolve itself. What exactly do you expect Israel to do, become religous, 'aint gonna happen. Ask your Rabbi, but it's mentioned, I think in Zohar but I'm not exactly sure, that before Moshiach arrives there will be a perioid of time where Israel will already exist under a secular government. What they clearly did not learn from the Nazis in Israel is how to be all inclusive. The Nazis killed every single Jew they got their hands on, Ashkenazi and Sephardic, whereas in Israel they segregate putting the Ashkenazi on the top tier, and the sepharadim on the lower-tier. If they want to learn from the Nazis, that's the lesson they should learn. We look up to these Rosh Ha'Yeshivas as G-d. No different the chassidim to their Rebbes. Understand they are all humans and in many cases plain fools and ignoramuses. The Rebbes are worse because all you need is being "born" lucky. At least with Rosh Ha'yshiva's you have to know a blatt gemorah!! Hold on a second, I was just thinking...that is also not true. Anyway, here is evidence to stupidity of the ones we jump around in front of. He seems to prone somewhat to exaggeration. “ That was the satmar reba zy'a shita. Rav Kook Zt"l disagreed. If u r quoting Kook, he would have allowed a homosexual to be the Kohen Godel. This Rosh Yeshiva should be aware that this is not only a Chilul Hashem but the well thinking Haredi youth is getting more and more disgusted of this kind of talk. Finally, they will not only go on mixed busses in Bne Brak, but they will leave everything behind, including their families, and travel in mixed planes and cars with a mix of man and women to Thailand and Sinai to get cheap and easy drugs in order to forget their Haredi past. Lets talk about the REAL important curruption issues. The Israeli government did medical experimentation on hundreds of thousands of Israeli children and babies without their parent's knowledge or consent between the years 2011 and 2015. The Nuremberg code of *"Informed Consent"* was set up after WW2 after the Nazis did medical experiments on the Jews in Germany and Poland against their consent. This is is actually an International war crime. The Israeli Gov and Misrad Habriyut used an experimental drug called the Sci B vac which was not approved by the FDA and did not pass level 3 testing. in other words it was a *test* drug. They did NOT inform the parents of this fact. The result is over 10,000 brain damaged children. That's close to a million parents whose kids were used as guinea pigs and with two grandparents three million people or half the country affected by Israel's greatest crime in its history!!! This is not the first time this has happened. Please watch the video of Shlomo Gordon confronting all of the members of knesset from all the parties familiar with health system, while he exposes they are all clueless as to what's actually going on in Israel affecting the next Generation of children and really don't seem to care. > Is there a state in the world where they don’t allow [gender] separation on buses? Apart from this country, here they don’t allow it. This is a state of idol worship. Even the Nazis, may their names be erased, knew that there should be separate living quarters for men and women. The first problem I see is that the statement (as written) is actually false in multiple respects. There are plenty of legal gender-separated buses even in Israel. They are "private" transportation. It is public transportation that is in question. Even in public transportation there is no law preventing gender separation by choice. Men can choose to sit with men (or not sit at all) and women can choose to sit with women (or not sit at all). What the law makes illegal is *forcing others* to sit (or not sit) according to dictates of a few. Those places (in the West) that have gender separated public transport do it correctly. Its purpose is to protect women from male aggressiveness, and as such, certain buses are designated female only vehicles (Mexico), while the incredibly crowded subway systems (Japan and Indonesia) are separated by gender for the same reason. To continue my previous post. The only places where such forced segregation takes place in the manner expected by those individuals who endorse it, is found only places like Saudi Arabia that "owns" women (where every female is "owned" by a male, so that a widow, for example, must receive permission from her *son* just in order to travel). So aside from the falsehoods of the statements (as worded literally), my main objection is that the proper concept of protecting women is converted to abusing women. As example, a person I know (who is a close relative of high ranking personages in the Ponevezh Yehsivah in Bnei Brak where he grew up during the War of Independence but now resides here) visited Bnei Brak recently with his wife. They sat on the bus facing each other across the aisle. A young male came on board and saw her seated there and immediately ordered the woman (who was old enough to be his grandmother) off. The husband (a tall fellow) grabbed the guy and made it clear he would end up in the hospital if he ever spoke like that to his wife again.